I'm a sassy little horse with an extraordinary talent, on my path to the Grand Prix. I know… I know how long it’s been since I’ve written. And I have no excuses – only apologies. But I’m back, friends – and I’ve missed y’all more than you know! So, let’s see… Where do I even begin? It was a fairly rough winter for both Mommy and me. I didn’t know that Southern California winters could get cold enough for me to need a blanket at night! Not all winter, of course… but there were definitely some cold snaps! Even the spring has been riddled with rainy days, chilly nights, allergies and injuries… But I’m officially back to work, getting back into shape, and I’ll be ready to start hitting up some competitions this summer! In March I turned 8 years old, and I’m sure you know what that means… don’t you? But that’s not to say that it’s all seriousness all the time, though. You know my Mommy… she loves to have fun and be silly, and she’d never deny me that joy! For my eighth birthday, Mommy baked me a carrot cake decorated with frosting and carrot sticks. It was delicious! And I have to admit that I’m glad Mommy didn’t get me a silly party hat this year, like she has every year prior. This time when she insisted on giving me a “party hat,” I told her I would just wear a normal, cool hat – because I was the life of the party, anyway! Thankfully, she agreed – and I got to pick the hat that I wanted to wear. So, naturally, I stole the one right off of Mommy’s head! Making Friends and Influencing… Kitties? Since the last time we spoke, I’ve done so many fun things and met so many new friends. …and we’ve even gone on trail rides alone! And I have to admit… she’s kind of my girlfriend now. We’ve been going steady since the winter. We were friends for a while before that, but there was one particularly rainy week when our bond just rapidly grew. Olive and I were both pretty bummed about the weather. And I know that we need the rain, but rainy days – and especially rainy weeks – mean that we can’t work or even go outside to play. And in Southern California, rainy winter days are usually pretty chilly, too! I get to see Olive every day, and it makes me happy that she and Mommy get along, too. Because, you know, sometimes “the parent” and “the significant other” don’t get along all that well! But we three – we’re a happy little family. I even got to start giving lessons to one of my friends, a girl named Madi! She’s much younger than Mommy, but she rides me just like Mommy does, and I love getting to jump and have fun with her! Now, even though I’ve been having a blast and loving my life, not everything I’ve done has been fun. Sometimes, there are things we have to do that aren’t fun, but they’re still necessary. 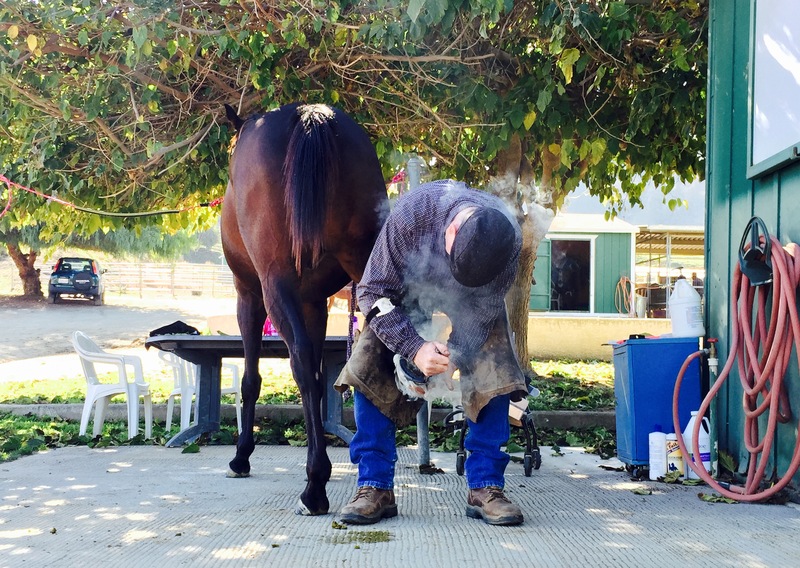 Although, I have to say, I’m incredibly lucky because my farrier, Tim Shannon (from Tim’s Horseshoeing in Southern California) is the BEST farrier in the WORLD – and he’s really nice! Well, friends, it’s been so nice talking to you again… I missed you. I really did. I’m sorry again that I was gone for so long, but I’ll talk to y’all soon… And that’s a promise! If you don’t already know, shenanigans can be defined as “silly or high-spirited behavior.” And that, friends, is what today was all about! So today, Mommy and I got to have a great deal of “silly and high-spirited fun” while jumping over a big ol’ triple oxer, showing off for the summer camp kids and counselors! Of course, we warmed up over smaller oxers first… But the real fun started when the oxer got up to 3 feet and 6 inches – because the spread (which just means the width of the jump) was 4 feet and 9 inches! 3’6 with a 4’9 spread? Come on, Mom… this is easy! Jumping big oxers like that is a lot of fun… but do you know what makes it even more fun? Having an audience to cheer for me when I clear the jump! And do you know what might even be better than marshmallows as a reward for doing well? Lots and lots of HUGS from my wonderful little friends! I love getting hugs! They’re the BEST! Of course, even though I do love hugs – and they might really be as good of a reward as marshmallows…. Mommy still gave me lots of marshmallows, too! Mmmm… My favorite jumping day treat! Thanks, Mommy! All in all, today was an awesome day. It might even be my favorite day in August – and the month has only just begun! I’m just saying that something super-duper-spectacular is going to have to happen in order to move up higher in the rankings than this wonderful, amazing day. Thanks to all of my new friends who came out to support me and cheer for me during my jumping demonstration! Y’all made it a fun, silly and exciting day for me – and I hope it was the same for you! My awesome friends who cheered me on during the jumping demonstration! Thanks, y’all! Well, that’s about all I have to share for today… Stay cool in this heat, friends – and I’ll catch y’all later! Friends, I’m sorry that it’s been so long since I’ve written; I can assure you that it has not been for any lack of excitement around here! Actually, there has been more excitement than I’ve known what to do with. I have a lot to tell you and a lot to catch you up on… but first, I have to tell you about what happened the other evening when Mommy came out to give me my dinner grain! As usual, I watched Mommy drive up and get out of her car. I waited (im)patiently for her to come over and say hello… but, to my surprise, she didn’t! She and Kimberly, Splash’s Mommy, were standing by the fence, staring at the horses in the neighboring ranch. When I saw some movement from the ground of the paddock by the hay feeder, I put my head over the top of my stall to get a better view of what was going on. I saw Mommy climb through the fence and run over there, and that’s when I realized that there was a horse down with his legs stuck in the fence of his pipe corral! He couldn’t get up! Mommy went to the horse and tried to calm him down so he wouldn’t thrash around and hurt himself, and then she looked him over to make sure he wasn’t seriously hurt. I saw her get up and run all the way to the other end of the neighbor’s property where it looked like there was a little barn or a house, and I could hear her yelling for someone to help. When she came running back alone, I knew that meant that no one was home over there. Before I could even make the suggestion to her, I heard Mommy say that she was going to go try to find the guys who work at our barn to help get the horse free. She asked Kimberly to go and keep the horse calm so that he didn’t injure himself by thrashing around, and then Mommy hopped back into her car and disappeared quickly out of sight. When Mommy’s car returned, she was followed by Cassie, one of the guys who works at our ranch, and his brother. They all hopped the fence and ran over to where Kimberly and the horse were. Cassie had a knife and some rope, and I could see that they were going to try to get the horse free, even though the owners of that ranch were nowhere to be found. Just a minute later, though, a big truck came driving up on that side of the fence and a guy and a lady hopped out. Everyone looked both calm and a little frantic at the same time. I strained my eyes to see farther (and by that, I really mean that I lifted my head – because, as you probably already know, that’s how we horses see things that are far away), and I realized that the horse also had his head caught under the raised hay-feeder! …and the horse’s head was caught underneath, with his neck resting on the bar on the bottom. It must have been so uncomfortable for that poor guy! The first thing the “Rescue Team” did was to put a halter on the horse (Mommy got that part done), and then Mommy held the horse’s head up while two people moved the hay feeder carefully away from the horse’s head. It’s a good thing Cassie brought a knife, too, because the hay feeder was tied to the pipe corral fence with bailing twine, and they had to use the knife to cut it in order to move the feeder. Then, Cassie and his brother wrapped some ropes underneath the armpit of the horse’s front legs and more rope around his back legs, and together, Mommy and the two guys rolled the horse over onto his other side, with the other lady helping to make sure that the horse’s legs got out from under the pipe corral fence while they rolled him over. Later, when Mommy finally was able to come over to me and give me my dinner grain, she told me that the horse had some big gashes from trying to free himself, but that he was otherwise unharmed. I was relieved to hear that! The only bad part was that the poor guy has COPD – chronic obstructive pulmonary disease – and that he was having a hard time breathing. The lady and the guy who work at the other barn were going to give the poor, sweet horse a shower and then clean his wounds and let him get some rest. As Mommy was telling me all this, we saw the lady leading the horse out of the wash area. The horse was stumbling badly, and then we heard the lady start to yell to her co-worker. I don’t think he could hear her, because he didn’t come running. Mommy, however, did. She ran over and climbed the fence again just in time to see the horse fall down – hard. I saw the lady point up toward the barn at the other end of the property, and Mommy took off in that direction again. I assumed that the lady had asked Mommy to get the guy that she had been yelling for; sure enough, Mommy and that same guy came running back down toward the lady and the fallen horse. The guy shoved something in the horse’s mouth – which Mommy told me later was a medicated inhaler – and then the horse lifted his head as though he was going to try to get up. He didn’t, though; I could see his sides heaving all the way from my stall. The poor thing had clearly blacked out from lack of oxygen! Once she knew the horse was okay and that she wasn’t needed anymore, Mommy came walking back over to me. She said that those nice people were going to let the horse lay there and catch his breath for as long as he needed to, and then they were going to continue taking care of his wounds. I was glad for the horse that he had people who cared so much about him. When I didn’t see that horse for a couple days after that, I began to grow worried; but, as it turned out, the people had just been keeping him up in the barn so that he could recover from this traumatic incident. When I saw them walking him back out to his paddock, I wanted to cheer! Instead, I just shoved my nose into Mommy’s pocket and sniffed for carrots or treats. So, that about sums up that bit of excitement… but there has been plenty more going on aside from that! Let’s see… Where do I even begin? Mommy has been stepping up the intensity of our workouts. She has this horrid little book – ummm, I mean… this awesome little book with A HUNDRED AND ONE exercises to prepare a horse for jumping, and she’s been pulling ideas from it constantly! That’s right. OVER A HUNDRED EXERCISES. And Mommy clearly thinks these exercises are great. Not that I don’t, of course… At least she doesn’t make me do more than one or two different ones each day. One if I have to practice harder before I can get it right, and two if I seem to pick up on one or both fairly quickly. All of these exercises have been hard work, but I have to admit that they’re actually kind of fun. They really make me think hard about what Mommy is asking me to do, and they force me to pay better attention. Mommy said that she feels I’m behaving much better in general lately – and I guess she thinks it’s because of that! Anyway, it hasn’t all been work without play… I got to jump a little one-stride line a few weeks ago, and it was pretty fun. We got up to about three feet high on the second jump, which was plenty for me. It’s a lot harder than you would think, going from one jump to the next with only a stride in between! I also got to meet a bunch of Mommy’s family one weekend. I got to meet some of her second cousins, as well as one of her great-aunts and one of her great-uncles. And they were all pretty great! I even got lots of hugs, which was the best part! You know how much I love hugs. And a couple days after that, I got to meet Mommy’s brother and sister-in-law! 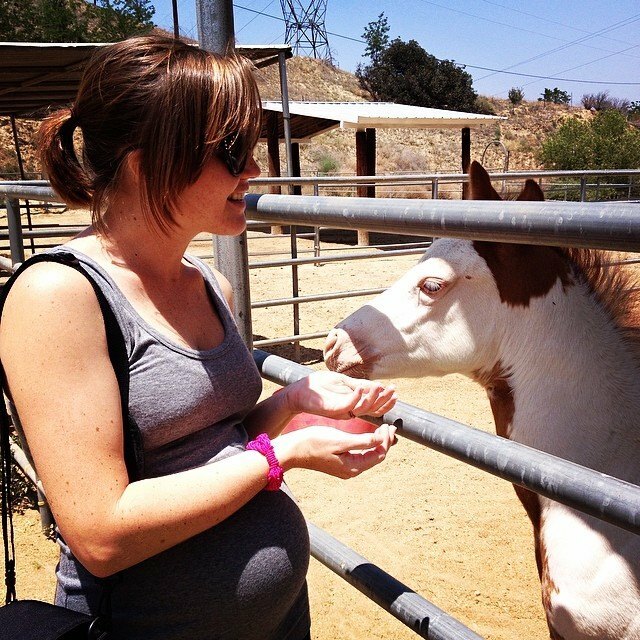 Mommy’s sister-in-law is pregnant with a baby human, so – naturally – she wanted to go over and say hello to the baby horse! But, of course, she was much more excited to meet me than any of the other horses… because, you know… I’m a celebrity and all that. It was truly wonderful getting to meet Mommy’s human family – and not only because they all gave me a ton of treats! I love making new friends, especially when they’re humans who mean so very much to my Mommy. The week following the excitement of meeting the family, I got to jump again! That time, though, we worked our way up to a vertical that was three and a half feet high! Now, as y’all know, that’s basically child’s play to me… Except for the fact that I’m still not in my top performance shape, so it was actually just a little bit difficult at first. But then it got easier and easier. I begged Mommy to let me jump higher, but she said that 3’6 was plenty high enough for that day. And just enjoying life in general. That’s about all the excitement that I have to share with you today, friends. I promise I’ll try not to wait so long before I write again! Stay cool, and I’ll catch y’all later! Sometimes, no matter how hard I try, I just can’t seem to concentrate on the things that Mommy asks me to do. It’s not always my fault, though; there are lots of distractions out there in the big ol’ world – and I’m a very curious character! Today when Mommy and I went down to the lower arena for our workout, there were two horses in the big paddock that’s next to that arena. Immediately I assumed that they were not horses, but aliens or monsters of some sort disguised as horses, because I’ve been here for a month now and I’ve never seen horses out in that big field. So, it was only natural that I was a little bit terrified of them at first. Being the good, patient Mommy that she is, she allowed me to walk over to the wall to say hello to the so-called “horses” and confirm that they were, in fact, only horses (and not aliens/monsters/shape-shifters). Well, once I knew for certain that they were of my own species, I wanted very badly to go and hang out with them. How much fun they must be having in that big, open field with all that space to run around! They obviously wanted me to come out and play with them, too, because they kept running back and forth along the wall of the arena on that side. It was very exciting! I love making new friends – and here were two horses that wanted to be friends with me, too! When I finally realized that Mommy was getting frustrated with me for ignoring her and pretending she wasn’t there, it was already too late. I heard her say the dreaded words, “Well, I guess this is nothing that a million 20-meter circles can’t fix…” and I knew that I was in for it. Yep, that’s right: I had to work on a 20-meter circle for the rest of my workout, which was a solid half-hour. Mommy doesn’t usually like to make me work on a circle for such a long time, because she knows that it can be hard on a horse’s joints to do such repetitive patterns for so long, but I have to hand it to her: her (diabolical) plan worked. I started paying attention to her instead of the other horses, because I probably would have tripped and fallen on my face if I tried to trot or canter a circle without looking where I was going. And it’s pretty tough not to keep your head down and your eyes looking where you’re going when you’re constantly being asked to bend to the inside. So, all’s well that ends well, and Mommy gave me lots of praise (and carrots) for finally being able to focus and put in some good quality work. Once I was all cooled down and Mommy had taken off my tack, I got to roll in my stall and take a long, cool drink of water from my automatic waterer. Then, I got a long shower and Mommy let me eat grass with my friends, Becky and Olive, until I was dry. A little more than an hour after I was done cooling out, Mommy gave me my grain mash. She likes to make my grain into a cold mash these days because she wants to make sure that I get enough water when it’s this hot out (even though I drink a lot and I have two mineral salt licks in my stall), but she also knows how much I love to be messy! Mmmm, I love getting mash-face when I eat my breakfast! Oh, and I started my monthly ration of Psyllium yesterday. I have to report that I love Psyllium! The kind Mommy got me tastes like apples and molasses, and it makes my breakfast that much more delicious. I’m almost sad that I’ll only get it for one week out of each month! Anyway, in other news… the new baby is still absolutely adorable and Robin is still a wonderful Mama. Ssshhhhh… The baby is sleeeeeeping! I still haven’t met either of them, but Mommy has been taking pictures for me and she confessed to me that she’s been sharing my carrots with Robin. I don’t mind, though. Mommies need lots of vegetables to stay strong so they can protect their beautiful babies, and I’m more than happy to share my carrots with Robin! Maybe that means that she and I can be friends someday… I just hope Mommy made sure to tell Robin that the carrots were from me! I know you might think that I’m referring to my own new life on the farm… but I’m not! I’m referring to an actual new life on the farm: a foal – a new baby horse! That’s right, friends: late Sunday night (or really early Monday morning), a foal was born right here on the farm! The farm where I live! It might be the most exciting thing that I’ve ever seen happen. Not that I was able to actually see the baby being born or anything… But you know what I mean, right? Now, I haven’t actually met the new baby girl yet, because her Mama, Robin, is very protective of her (…just like a good Mama should be). If another horse were to get too close to her baby, Robin would definitely try to chase them away. That’s good maternal instinct on Robin’s part – but her baby doesn’t necessarily know how to get out of the way yet. In fact, all Baby Girl knows how to do right now is stay close to her Mama (and nurse, of course) – so Robin could accidentally hurt her baby while trying to protect her. That’s why I’m not allowed to meet Baby Girl yet. But yesterday morning, after my workout, Mommy let me watch from the arena as she went to introduce herself to Robin and the new baby. She knew that I wanted very badly to introduce myself, too! Hurry back, Mommy! I want to hear all about the new baby! Mommy even took pictures for me through the bars of their pipe corral so that I could see the baby better! While I watched from the arena, the little filly was playing and being incredibly sassy! She even cantered alongside her Mama (who was only walking), and she seemed very graceful. She has such long legs! It was amazing to see how graceful she is with those long legs, especially since it was only her first day using them! It’s taken me seven years to figure out my own long legs… and I still trip over myself sometimes! I can’t wait to see what this baby does when she gets older. I just know she’s going to be a superstar! After I had a good roll in the arena, Mommy gave me a shower and then let me graze while I dried. I love grazing in the sunshine and hanging out with my Mommy. It’s even better when some of my kitty friends come to hang out with me, too! Olive came over to enjoy the sunshine with us. She’s a very sweet cat. She talks a lot! She always has something to say or a special song to sing. I want to sing along with her, but I always try to be extra calm and gentle when she’s near me so that I don’t scare her or make her think that I don’t want her around. I love having her around! I really think she likes me, too; she gives me lots of “kitty hugs” by bumping me with her head and rubbing her body or her tail against me. I love it when you give me hugs, Olive! After hanging out with Olive for a little while, Becky came over, too! I think she might have been jealous that Olive was getting all of the attention. She was talking up a storm! Don’t worry, Becky! There’s plenty of love and sunshine to go around! It’s nice to have so many friends around me all the time. Friends make life so much better than it already is! Honestly, the only thing that would make my life absolutely perfect is if Daddy were in California with us, too. Oh, and if I could start jumping five feet again. I know, I know; both of those things will happen in time. I just have to be patient. Anyway, I guess that’s all that I have to report for tonight. I’ll keep y’all updated on the baby horse and I’ll have Mommy take lots of pictures of her every day! It’ll be fun to see Baby Girl grow up… and it’ll be cool to know what her name is going to be!